For the first time in nearly two decades, the share of U.S. births to unmarried mothers ticked downward in 2014, according to new preliminary data from the National Center for Health Statistics. The report also showed that the total number of births and the U.S. birth rate rose in 2014 for the first time in seven years, reversing a decline linked to the Great Recession. In 2014, 40% of births were to unmarried mothers, a slight decline from the 41% share that had held steady since 2008. The share of births to unmarried mothers had been climbing more or less steadily for many decades; the last dip happened in 1995. Although the single percentage point drop in 2014 was small, it was only the third one-year dip in this measure since the end of World War II. The decline also is notable because it occurred among all racial and Hispanic origin groups. Still, the share of children born to unmarried mothers has more than doubled since 1980, when it stood at just 18% of births. One factor behind the decline in unmarried births, according to the National Center for Health Statistics, is the changing demography of motherhood: Births to younger women are down and births to older women are up. Most women who give birth in their teens or early 20s are unmarried; most who have babies in their late 20s are married. The rising share of births to older women is due in part to women delaying childbearing, for reasons that include staying in school longer to gain more education. Dramatic declines in teen births also are a factor. Now, 43% of births are to women ages 30 and older. As recently as 2000, that share was only 36%. The downward tick in the share of births to unmarried mothers coincides with the end of a recession-related downturn in overall fertility. The Great Recession played an important role in reversing a rise in the number of U.S. births, which peaked at 4.3 million in 2007. Both total births and the birth rate declined each year from 2008 to 2013, but rose in 2014, according to preliminary data. Historically, births have declined during economically hard times and risen again when the economy recovers. There were 3,985,924 babies born in the U.S. in 2014, an increase of nearly 54,000 from the year before. The number of births increased in 2014 for non-Hispanic white and black women, as well as for Asian and Hispanic women, while decreasing for American Indian mothers. The birth rate — that is, number of births per 1,000 women in the traditional childbearing ages of 15 to 44 — grew to 62.9, from 62.5 in 2013. The rate generally rose for older women, and declined or held steady for women younger than age 30. 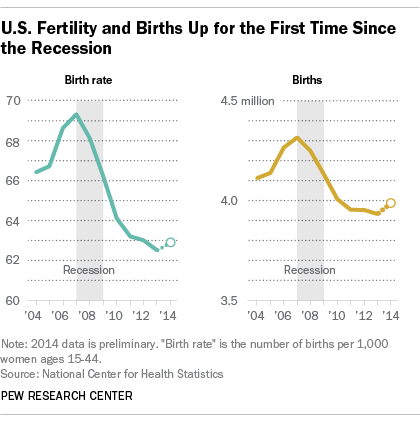 The teen birth rate, generally declining since the 1990s, fell to a historic low. Not only did the share of births to unmarried women decline, but so did the birth rate for unmarried women, to 44 births per 1,000 women ages 15-44. The rate has gone down for six consecutive years after rising for decades, and in 2014 was 15% lower than its all-time peak in 2007 and 2008. The number of births to unmarried women rose by about 9,000 in 2014, to 1.6 million. But it remains below its 2008 peak of 1.7 million.